Installing Windows and finding all the correct drivers can be difficult on a desktop computer. If you use the wrong drivers when you install Windows, components on your PC may not work properly, may work slower or may not work at all. When we install Windows on your computer we make sure we use the most up to date drivers available for your device. We can also backup all of your old data and return the backup in the new Windows installation. We will also install any other software that you have a license for. 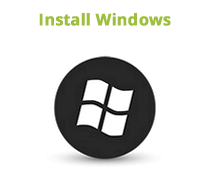 We can install Windows for you usually in just a few hours if you don't require a backup of files. If you need to backup your data, it can take 1-2 days depending on the size of the backup. The service price includes installing windows, the latest drivers, useful freeware utilities and software plus any software you have licenses for. There is an extra charge of R450 if you want your data backed up and returned in your new Windows installation.